Rockport Massachusetts is a quaint seaside town located east of Gloucester, the only bordering town, on the tip of the Cape Ann peninsula. Surrounded by water on three sides by the Atlantic Ocean this town offers miles of lovely beaches and picturesque scenery. Having once been an uninhabited part of Gloucester and used primarily as a source for timber used in shipbuilding it has since been developed. Early on it consisted primarily of large estates and summer homes with a small fishing village. Rockport was also one of the first granite quarries. 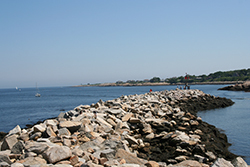 Granite from Rockport was shipped to cities and towns throughout the east coast area. Rockport is also known as an artist's colony and is the subject of hundreds of paintings and photographs. 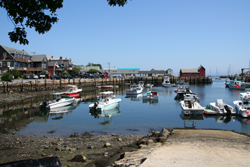 Today Rockport is a suburban residential town, still home to fisherman and artists as well as a host to tourists from all over the New England area. The rocky shore, five beaches, three islands and seaside parks are the main attractions yet you will find the national wild life refuge, protected forests and reservations enjoyable as well. Rockport also offers exquisite dining, unique shopping and activities such as hiking, sailing, diving and whale watching. Rockport school districts include preschools, elementary school, middle school and Rockport High School as well as three private schools for early childhood, preschool and head start. Thinking of getting a new home in Rockport? What about selling your property? If you are in the market, feel free to contact our office and we will connect you with one of our agents, who are very knowledgeable of the Rockport area. Here at RE/MAX Advantage, our agents are long term locals and love to share their knowledge and love for the community. Our realtors are highly trained and utilize the most sophisticated tools behind them to help you find your dream home or sell your property for the highest possible price.